Hey guys. This is my first post, and I dunno if this allowed, but I don't know WTF this is. This guy is very old, as you can probably tell. He is from the late 1800's. The label he came with is "Elliot's Hummingbird". Apparently this guy got drunk and ran around the jungle naming all the hummers after him because I found many birds with this name* after Googling for a live image. The four different birds I found are: A single specimen that is a hybrid of Anthracothorax nigricollis (Black Throated Mango) X Chrysolampis mosquitus (Ruby Topaz), and the Wine Breasted Hummingbird, the Violet Chested Hummingbird, and the Amazilia Hummingbird. None of these birds look like what I have. After being totally bummed out that the narwhal AND the shoebill stork had already been posted, I realized that the FRILLED LIZARD had not (or at least not that I could find). 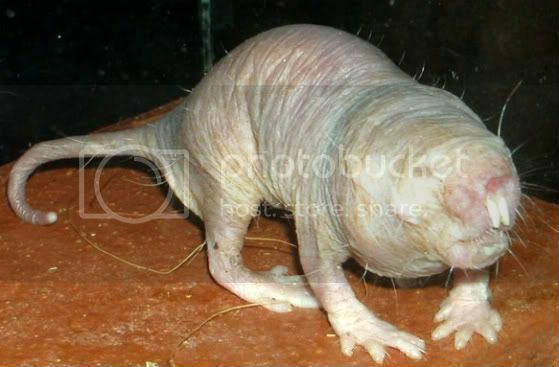 The naked mole-rat (Heterocephalus glaber), also known as the sand puppy, or desert mole-rat is a burrowing rodent native to parts of East Africa. It's unique among mammals in that they are cold-blooded, they can't feel pain, and it's one of only two mammal species that lives in an insect like eusociality with a single breeding female queen presiding over an entire colony made up of all members of the same family. 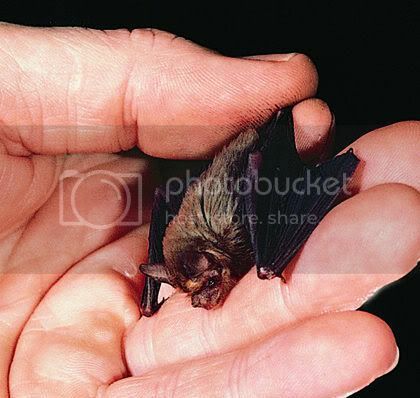 According to the Animal Diversity Web Thailand's bumblebee bat (a.k.a. Kitti's hognosed bat or Craseonycteris thonglongyai) competes with the Etruscan pygmy shrew for the title of world's smallest mammal. At issue is whether skull size or mass defines "smallest"; shrews are lighter but the bumblebee's skull is smaller at 11mm. These bats are so-named since they're about the size of a bumblebee, weigh about as much as a dime, and have the ability to hover like hummingbirds. Their roosting habitat consists of the hot upper chambers of caves in limestone hills. They are most active at dusk when they fly around the tops of bamboo clumps and teak trees to feed on insects. Craseonycteris thonglongyai is a colonial animal, roosting in groups in caves (Macdonald, 1984). However, an individual within a group is solitary. Though close to others in its group, it hangs alone, rather than clustering tightly. It is most active at dusk, at which time it flies around the tops of bamboo clumps and teak trees (Nowak and Paradiso, 1983). The bumblebee bat is endangered and rare, a CITES list animal. The total population is estimated at two hundred individuals. 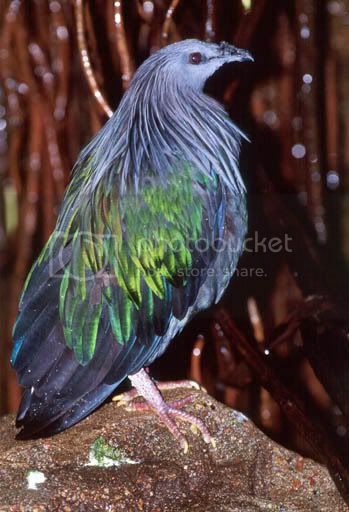 The Nicobar Pigeon (Caloenas nicobarica) is the last surviving member of the Caloenas family, which once (spuriously) included the recently extinct Liverpool pigeon- they also are believed to be the closest living relatives to the Dodo and the Rodrigues Solitaire, which belong to the all-extinct Raphinae family. Even though the Nicobar Pigeon is believed to be genetically the closest, it's still wildly distinct from the Raphinae, just a bit less so than other pigeons and doves. So I joined this community after much reference to it in wtf_inc and I thought of this insect I used to catch all the time as a kid.. They are called velvet ants.. they come in a vast variety of colors..
velvet ants, are a family of wasps which resemble ants, and belong to the same super family. The velvet ant name refers to their hair which may be red, black, white, blue, silvery or golden. In some places they are also known as cow killers or cow ants. Hi, um, first time poster, long time lurker? Psoriasis is an auto-immune disorder that affects the skin and joints. There are many different and completely nasty kinds of psoriasis, but in this post I'll talk mostly about Plaque Psoriasis, which is the most common form. Hoped you liked my little skin-lecture! Here are some more gross pictures, for those who're interested. I put little snippets of text from the websites for people who don't like links. I also scrolled back over 200 entries to make sure this wasn't a repost. However, I am lazy and possibly missed it so let me know if it is a repost. "These beetles are easily mistaken for caterpillar droppings. Even after a collector thinks he has learned to recognize them, he can still be fooled -- occasionally in collections there are caterpillar droppings that have been mounted and labeled, right along with specimens of warty leaf beetles." WHUT? "YANGON, Myanmar - A crocodile attacked and killed a man who was under arrest for alleged illegal logging in Myanmar, the country's state-run newspaper reported Sunday. Myint Zaw was being transported by forest rangers in a boat in the Ayeywarwaddy river delta when the crocodile knocked him out of the boat and killed him, the Myanmar-language Kyemon daily reported." Birds are well known for their parental care, patiently incubating their eggs and then bringing food to their young until they are old enough to look after themselves. However, certain birds, known as "brood parasites," lay their eggs in the nests of other birds and do not provide any parental care for their own offspring. Care that the "hosts" provide to the young parasites is care denied to their own young. This often has a detrimental effect on the reproductive success of the hosts and may affect their population numbers as well. There are two types of brood parasitism, non-obligate and obligate. Non-obligate brood parasites lay eggs in the nest of conspecifics (i.e. same species) and in their own nests. Examples include several colonial nesting species such as Bank Swallows or African Weavers. Obligate brood parasites lay eggs in nests of other species and have completely lost the ability to construct nests and incubate eggs. Examples include Brown-headed Cowbirds and European Cuckoos. About 1% of all known bird species are obligate brood parasites. Other obligate brood parasites include: all African Honeyguides, about half of the species of cuckoos, the Black-headed Duck in South America, Shiny Cowbirds, Screaming Cowbirds, Bronzed Cowbirds, and Giant Cowbirds. Didn't look as hard for this one. Hopefully not a repost.